Welcome to Hotel Bellavista Limone sul Garda. Hotel Bellavista is located on the pedestrian promenade along the lake, and it's provided with private car park. The hotel was opened in 1907 by Family Segala, that is also the current proprietor, in a private venetian residence, that goes back to 1650; it is particularly attracting and unique in Limone sul Garda. The hotel is situated in a garden, characterized by the typical flora of the lake: orange trees, lemon trees, tangerines, palm trees, olive trees and wonderful flowers. Among trees and flowers take place the restaurant-and bar-tables, from which you can enjoy a magnificent landscape. The restaurant, with speciality of fresh-water and salt-water fish, is provided with an excellent pizzeria, too. In these places the guests of the hotel can, if they want, have their meals. Restaurant and bar have a separate conduct from the hotel. In front of the hotel there is the possibility of berthing (it's possible the berthing of/there are some berth for) sailing boats and motorboats. Leaving from Limone sul Garda, it's possible to make a wide and very interesting range of trips in the most important North-Italy cities (for example Venice, Verona, Florence, and so on), as well as delightful trips on the lake by equipped boat and hydrofoil. Very interesting are also the car-trip in the most famous places of Lake Garda, of the Dolomities, and many others. For the excursions' lovers theres is a very wide change of choice. 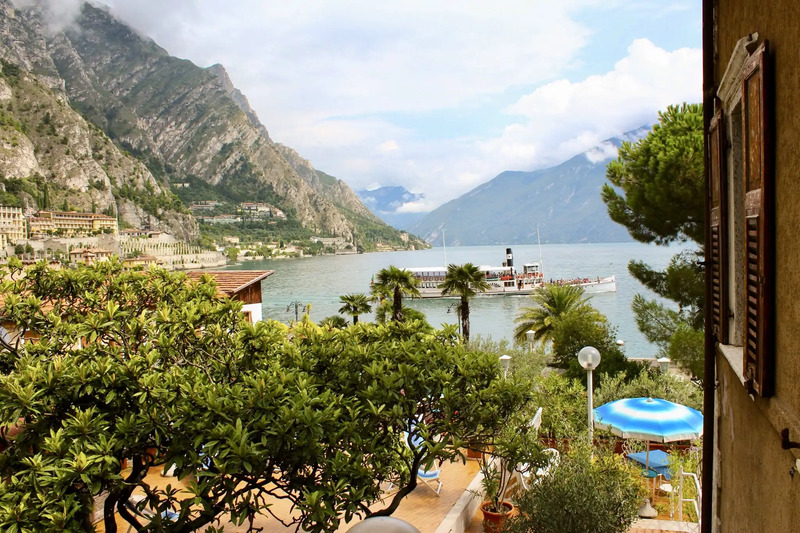 (Hotel Bellavista Limone sul Garda hotels).